The light gray colonial house at 400 Burr Street was built in 1764, before America was America, and it was updated to include modern day amenities. 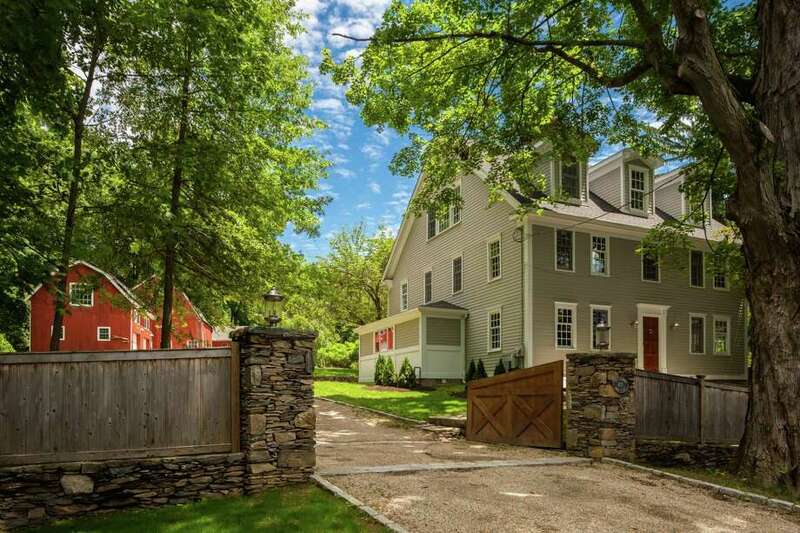 FAIRFIELD — A former onion farm with ties to the prominent Burr family came up smelling like a rose after a recent construction project of the main house and one of the property’s three vintage barns at 400 Burr St..
During the renovation and expansion of the light gray updated antique colonial house, about 80 percent of it was dismantled and rebuilt. Historic elements of the 18th century house were preserved including the original central chimney and fireplaces and hand-hewn beams, while the construction team seamlessly incorporated modern amenities. They transformed this house into the perfect blend of authentic New England charm and luxurious 21st century living with an open floorplan, spacious chef’s kitchen, and a grand master bedroom suite. It has a new roof, new windows, new siding, new systems, and extra insulation. This 4,450-square-foot house may still have a connection to the past, and it may provide the perfect venue for everyday living and entertaining, but with the updates this house now belongs to the ages. The juxtaposition of old and new are evident inside and out. Inside, hand-hewn beams and red brick fireplaces - some of them original, are joined by French doors and sophisticated millwork. Outside, the three red vintage barns sit on the 3.2-acre level and gently rolling property that is also shared by a tennis court, which is undergoing a “facelift” of its own. The barn closest to the house was restored as a two-car garage with an upper loft that can be used as an office, art studio, gym, or game room. This barn features solar panels on the roof for electricity, heating, and cooling. The house was built in 1764, “before America was America,” according to the homeowner. A document from the Fairfield Museum and History Center indicates the house and property were sold in 1791. Abel and Samuel Burr sold it to Isaac Webb for “75 pounds of lawful money.” Pounds, not dollars, even though it was post-Revolutionary War. The document says Samuel Burr lived to the north and to the south was Ebenezer Hill’s land. A tract of land farmed by Hill was where the Rev. Aaron Burr Sr., was born. Burr Sr. was the father of Aaron Burr, the third vice president of the United States during Thomas Jefferson’s first term as president, and Burr is the one who killed Alexander Hamilton in a duel. It sits in the lower Greenfield Hill neighborhood, called Greenfield Parish back in Colonial days, only minutes from town, train and schools. The downtown Fairfield train station and access to I-95 are just three miles away. The Merritt Parkway is about the same distance away in the opposite direction. Shopping along Black Rock Turnpike is just about two miles from this gated property. To enter the property pass through the stone pillars topped with lanterns and the custom-made gates and travel up the crushed stone driveway lined in Belgium block to the ample parking area by the barns. Inside, the spacious formal living room features a fireplace with an ornately carved mantel depicting lions’ heads, an unusual beamed and coffered ceiling, built-in shelving with interior lighting, a bay window, and a cerused oak floor. Two sets of French doors lead to the sizable stone patio and yard. In the formal dining room the mantel of the marble fireplace is attractively decorated, although not nearly as ornate as the one in the living room. The dining room also features a built-in hutch and corner china cabinet. French doors separate it from the adjacent mudroom and family room, which was probably the original kitchen of this house. It has a large fireplace with a swivel arm to hang pots. In the modern kitchen there is a large center island/breakfast bar, casual dining area, granite counters, high-end stainless appliances, and a corner fireplace. On the second floor there are four bedrooms. The spacious master suite features a vaulted ceiling, walk-in closet, and spa-like bath with radiant heated flooring, an over-sized shower with a rain head and body sprays. One of the other bedrooms is also en suite. On the finished third level there are two more versatile rooms with high ceilings, a walk-in closet, and other storage spaces. There are other benefits to choosing this as a home. It is within easy proximity to the municipally owned and protected 38-acre Springer Glen Open Space, where hiking and fishing are allowed, and Mt. Laurel Park Open Space, and the Aspetuck Land Trust’s Harwood Preserve. Best of all, for those with school-age children, the bus stops right at the driveway entrance. For more information or to set up an appointment to see the house, contact Floria Polverari of The Vanderblue Team/Higgins Group Real Estate at 203-615-3170 or floria@vanderblue.com.